Study with others - This only goes for people with enough social self control to be around others when there's work to be done. But, I appreciate sitting at a table with a friend while doing work - it makes me happier, it makes me feel more obligated to study and it's nice to know someone is in the same boat. Take breaks - Taking short breaks is a great way to reward yourself for getting work done/learning information and it helps keep your brain from getting exhausted too quickly. Eat and sleep - Seems obvious, but I sometimes put eating and sleeping on the back burner during hectic times of the year. Pack snacks for studying and build in some naps! Calm Environment - Good lighting, not many distractions, an open work space, no background noise - all help when learning and remembering lots of information! Listen to music - Listening to classic music while studying doesn't really work for me, but I love listening to my favorite artists just to stay energized, interested and awake while I'm studying. Practice tests - Before your exam, do a practice version of the exam to prepare! I sometimes make my own exam with possible questions or have a friend quiz me over the test information. All of these get your mind prepared for an exam and calm your nerves. Hi! Thanks for stopping by. 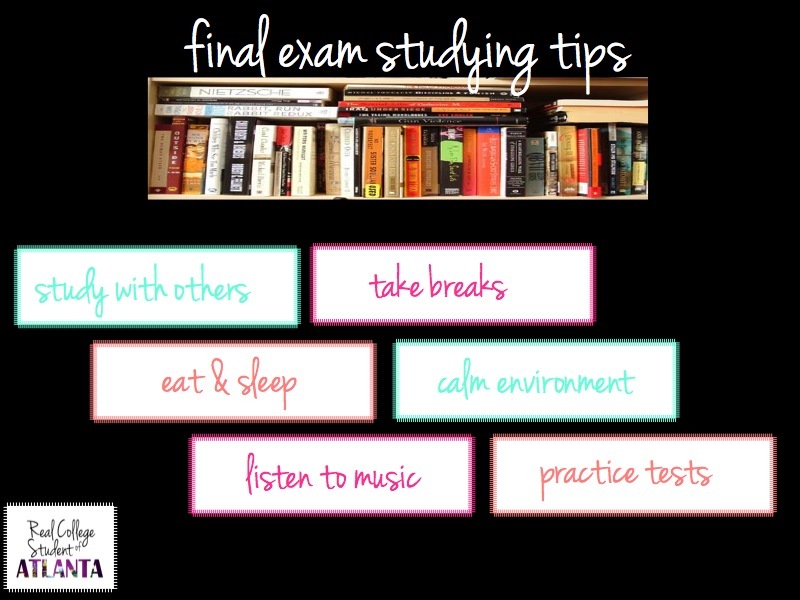 I would love to follow you, love the tips for finals!